This necklace reminds me of a sunset I viewed years ago while traveling through Texas. I've created this piece using vintage and contemporary lucite, vintage jewelry components and antiqued brass findings. I stacked vintage enamel and lucite pieces to construct the focal pendant. 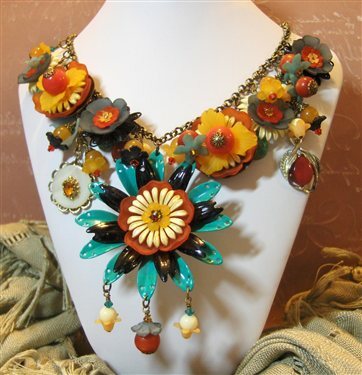 The muted shades of orange blend beautifully with the colors of the turquoise. Each drop has been individually created and hand wrapped. The necklace measures 19" and closes with an antiqued brass hook clasp.